FIGURE 4.2 Seventy-three-year-old female with sudden right hemiparesis, left facial weakness, dysarthria, nausea, and downbeat nystagmus. Posterior circulation angioplasty demonstrated occlusion of the proximal basilar artery (arrows— a and b). Note the retrograde opacification of the superior cerebellar arteries through postero-inferior cerebellar to superior cerebellar arteries collaterals (b). FIGURE 4.2 (Continued) A compliant balloon was used to perform angioplasty (c). 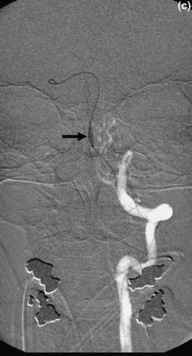 Postangioplasty angiogram demonstrated complete recanalization of the basilar artery and its major branches (d and e). 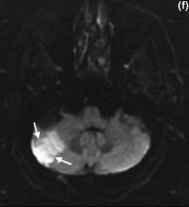 MRI performed 2 days later demonstrated only small areas of infarction in the cerebellar hemispheres (arrows—f and g) but no brainstem or occipital infarcts.